This reserve is made up of four meadows, three of which make up one of the best areas of limestone grassland in Gwent. 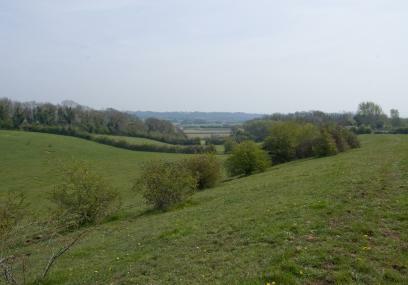 The area also has a rich archaeological heritage – this includes evidence of activity from the Iron Age, Roman times and the Medieval period. The lime-rich soil promotes a diversity of grassland flowers – over seventy species of plant have been recorded here. The meadows are managed using traditional farming practices to promote species diversity. Rotational cattle grazing is a feature of the management, with the cow pats being an important breeding site for the rare hornet robber-fly. The meadows contain a diverse limestone flora. Notable species include green-winged orchid, cowslip, large thyme, yellow-wort and salad burnet. Many species of butterfly and moth are attracted to the diverse flora. A rare solitary bee is found on the reserve, which only feeds on field scabious flowers. In autumn, the meadows support large numbers of grassland fungi. The reserve is made up of grassy fields. The terrain is steep and muddy in places. Cattle will be grazing the reserve. There is a mixture of field and kissing gates to access the reserve. From Chepstow take the A48 towards Newport. After 3km turn left onto the B4245 to Caldicot. Pass through Caldicot and then turn right onto the Dewstow Road, signposted Caerwent. Follow this road over the M4 for about 1.5km, then turn left for Shirefield, after Dewstow golf club. The reserve entrance is immediately on the right. There is parking for two cars by the metal gate (grid ref: ST 470 896). Forestry Commission woodland walks are located at Slade Woods, next to GWT's Lower Minnetts Field reserve. Other nearby attractions include Caldicot Castle and Country Park and the Roman remains at Caerwent. The reserve is made up of grassy fields. The terrain is steep and muddy in places. Cattle will be grazing the reserve. There is parking for two cars by the metal gate.